Let’s make your business or side hustle a hotbed of play and creativity…….again! And how many times have you BEGGED and wished for those moments of FLOW and feeling so CREATIVELY turned on, to return. BUST out of your routine and office for a day of painting, writing and brainstorming exercises designed to get the creative sparks and paint FLYING. Bonus: no BORING power points and we’ll be going screen free for the day! IT’S THE CREATIVE SPARK YOU’VE BEEN LOOKING FOR…. All our screen-time, sitting in the same place, staring at the same wall (or window with a view of more than just concrete, if you’re lucky) and doing the same routine day after day, can leave us feeling like our business, creative project or practice is more like a CHORE and less like the FUN, PLAYFUL AND JOYOUS, activity it once was. We’ve all had those experiences - whether it’s after you’ve strolled through a forest trail with hints of pine scent in the air or sat down with a hot cup of loose leaf rooibos tea at a cafe…..where this FAMILIAR feeling bubbles up. It’s in those moments of exploring new spaces and stepping away the screens that you find yourself filled with ideas, inspiration and this JOLT of electrifying energy….it’s your CREATIVITY..it’s here and ALIVE. We don’t have to head off to an all-inclusive vacation or book a cabin in the woods (though that is ALWAYS a good idea) to give ourselves that expansive and energetic feeling of having our creativity REIGNITED. 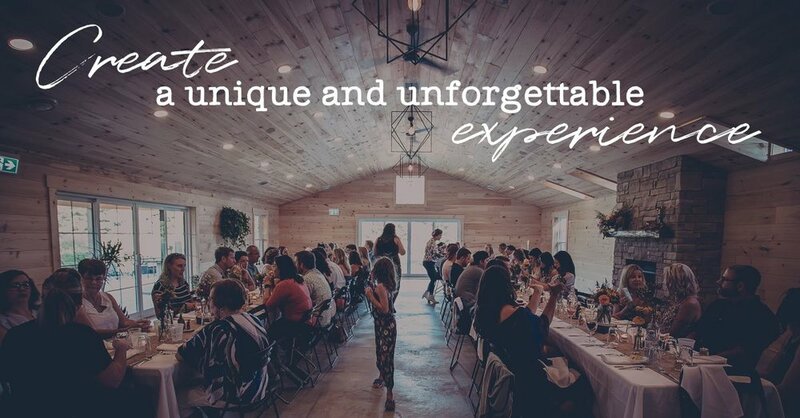 In fact this CREATIVE SPARK you’re looking for could be just a short car drive away, to a lush farm surrounded by bees and blossoming botanicals, where a creative oasis awaits you. Let’s get this playdate/party started! Cue music, dancing, process art and mess making to get us warmed up! Like musical chairs BUT better, you’ll be rotating through maker stations, writing, brainstorming and PLAYING your way through the morning. Kit building and the creative process. We’ll discuss what the creative process is, how we each have our own unique approach to it and steps to uncovering yours. You’ll begin building your creativity kit, which you’ll have to take back to the your home, office and space so you can continue to spark CREATIVITY and PLAY when you need it most. REFUEL TIME! Pause and enjoy a tasty vegan lunch made by Yoda’s Kitchen. Followed by free time to chill and relax before we get creating again. Spending time in best studio of all….NATURE. We’ll discuss the importance of space, rest and breathing room and how we can use it to nourish our creativity. It’s a FREE for ALL. Go back to a maker station, find a comfy corner or bust out the paints. You’ll get the time and space to play and create the way you want too. Cool down and wrap up. You’ll finish building your creativity kit and we’ll gather to share our creations from the day and send one another off in our best creative cheerleading way we know how…..with one last round of DANCING + CELEBRATING of course. It feels like you’re stuck in a creative drought and you want to get the creative juices flowing like Niagara Falls AGAIN. You’re in a bit of creative hibernation, surrounded by screens, spreadsheets and critical paths and you can’t remember the last time you made something JUST for the FUN of it. You want to treat yourself after getting your taxes filed early and the same wine and cheese board while re-watching Friends routine, just doesn’t feel special enough for this occasion. The coffee and green juice combination just isn’t making the cut when it comes to giving you that rush and BOLT of energy you need to be CREATIVE. You’re feeling a spring fever coming on and you’re itching to escape the office for a day. You need an excuse to procrastinate (or skip out all together) the annual office/home spring cleaning ritual. WHat they’re saying about attending revel workshops…. 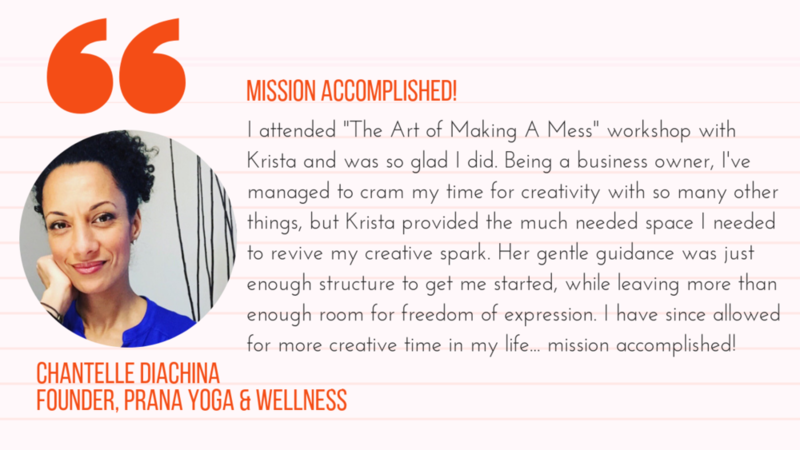 Hey, I’m Krista Kankula, owner/founder of Revel in the Mess, obsessor of pink (the shade/colour, NOT the singer, though I think she’s pretty cool too), vegan poutine and the CREATIVE PROCESS. The moments where I’ve felt most creatively ALIVE and fulfilled have never come from staring at a screen or tapping away at the keyboard. They’ve come when I’m cozied up in a coffee shop I’ve never been to before or when I’m sitting in Victoria park while eating a chickpea salad sandwich on one of those cool, but warm enough to sit outside spring days. The ideas and colours flow out of me and onto the page when I’m sitting in the window at a Quebec Monastery staring out at the snow trickling down in the courtyard or sitting on the dock with the murky waters of Lake Noris below me. Our creativity needs to be SPARKED with PLAY, impromptu dancing, stepping away from the screens and making art with our hands, doodling in notebooks, nature, SPONTANEITY AND new perspectives (and spaces). BUT LET’S FACE IT……We live in a world that would much prefer we stick to routines and staying attached to screens. THIS is exactly why I created Sparks + Splatter, so we can take a stand, step away from the routines and screens to MAKE room for PLAY and CREATIVITY in our lives. I can’t wait to see what we create together on April 12. I hope you’ll join me (and 35 other awesome people seeking more PLAY and CREATIVITY). Will you be hosting another Sparks + Splatter Creative Playdate this year? While I’d love to host one of these every week or every day for that matter, THIS will be the only Sparks + Splatter playdate I host this year. Can I pay the registration fee in instalments? Let me start by saying, I get where you’re coming from. I didn’t consider myself creative for a long time, I always had messy writing, my drawings we’re limited to 3D cubes and stick figures and still to this day I can’t cut straight with scissors and it irritates me. BUT what I’ve come to learn is that WE’RE ALL CREATIVE. It’s just that we need the chance to reconnect with our creativity. And often we also need to unlearn what we think creativity is. So often we limit creativity to someone who’s a talent painter, cartoonist, a novelist or playwright. But how we express our creativity really is limitless. Trust me, you are creative and Sparks + Splatter will help you reconnect with your creativity. When you say “creative sparks + paint will fly”…how messy are we talking? We’ll be participating in process art and painting activities, that being said the flying paint will be directed at the canvas and paper, not splattered around the room or on one another. We recommend you dress comfortably and if you’d prefer to be on the safe side where something you wouldn’t mind getting a touch (or two) of paint on. That is of course if you’re a messy painter like I am and even though you try to be neat, somehow you always get paint on yourself. like a day spa for your creativity. Register today and get ready to pamper it.